We have all imagined our perfect watch. You know, a dial like that, but with these hands and a case that looks just like so... Then we quit daydreaming and get back to our lives. A select few do something different. They quit daydreaming and start doing. They design and produce their own line of watches. Nadim Elgahry is one of those who moved from dreamer to doer and his line of Makara Octopus 200m dive watches is currently in pre-production with a projected December delivery date, and available for purchase at a very attractive pre-order price. The project began in earnest in April of 2013 when Nadim floated the idea and some renderings on the Watchuseek Dive Watch forum. With input from the community, and discussions with suppliers, he refined the design and by June he had a final concept ready to offer. Throughout the process, he has kept the forum informed, providing frequent updates and photos. He as also started a drawing for a free watch with multiple entries for those who post a comment in the above-linked thread, share the thread on social media or blog about it. Yes, just like I am doing. The Time Bum believes in full disclosure. 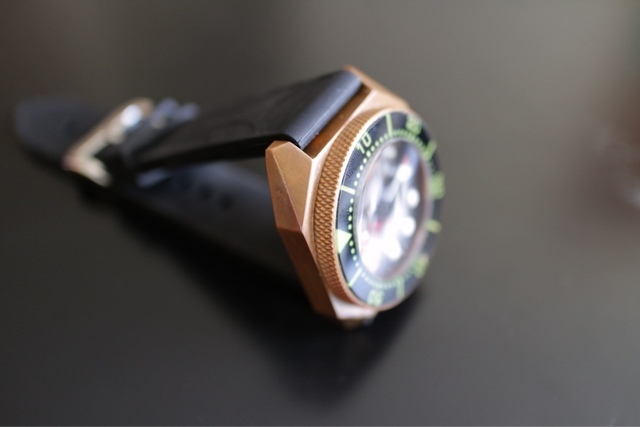 The Octopus has a beefy and refreshingly unconventional octagonal 44mm case of brushed stainless steel or bronze. It is 52mm lug-to-lug 15.75mm high and accepts a 24mm strap. It sports a 5mm domed sapphire crystal with anti-reflective coating, knurled crown and bezel, and black sapphire bezel insert. The overall effect is solid and purposeful, underscored by the hard angles of the octagon. The dial is conservative but nicely executed with polished, raised round markers and polished ploprof hands. The hands, markers and bezel insert will all be treated with C3 SumerLuminova, offset with a red second hand. Dials are black, brown, blue, or green. It's heartbeat will be provided by the revered Miyota 9015, 24 jewel automatic. The price is $295 for the stainless steel case or $375 for bronze. Those prices will rise by $100 after the preorder period ends. Only 50 watches of each dial/case combination will be produced, and you even have the option of reserving a serial number. With a Miyota 9015, these are excellent prices, doubly so for a bronze case. Of course no venture can ever be a sure thing. Production delays and errors can delay or derail even the most carefully considered project. That said, the Makara Octopus looks particularly interesting. 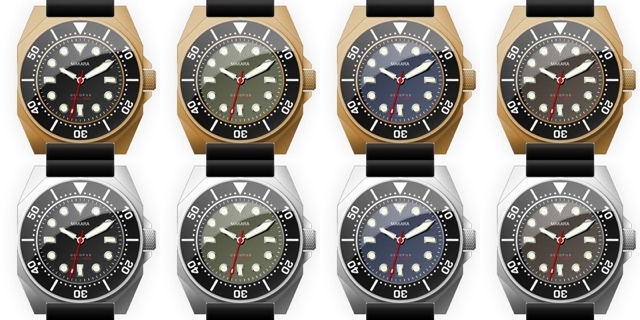 Read more at Makara Watches, and the Watchuseek Dive Watch Forum.